Fitbit Versa is very different from its predecessor, the Ionic. Its amazing design and great battery life put it in a position to compete against pricier smartwatches like the Apple Watch 3, but lack of GPS is disappointing. The Versa helps you track a variety of activities, such as swimming, running and cycling. Another big feature added to it is menstrual cycle tracking and it will look stunning on people with slim wrists. However, there are many areas like, its app support and smart features that need improvement in order to make it shine more and Fitbit really needs to consider those. The Fitbit Versa has a simple but attractive design. 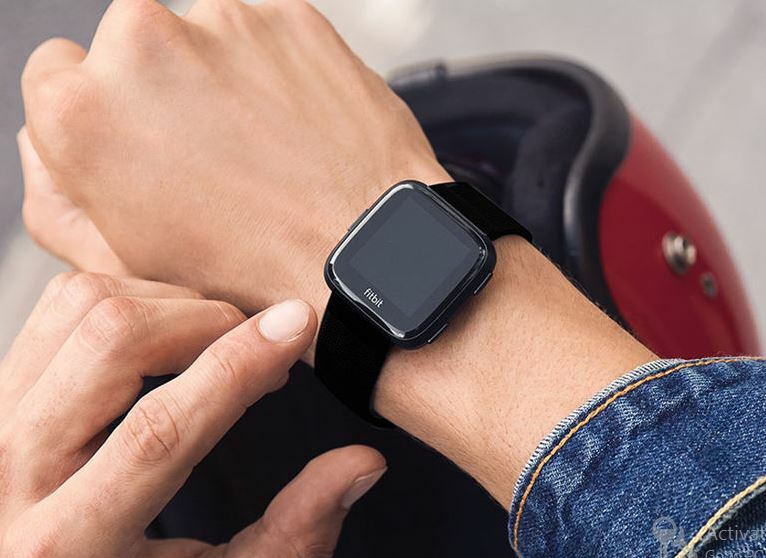 The rounded square body may not be everyone’s choice but its sleek look can be the reason for many people to prefer it over other smartwatches. Its slim aluminum body is comfortable to wear and sits flat against your wrist. The Versa exactly looks like the Apple Watch, if you are some distance away, but obviously physical buttons are differently placed. There is one key along the left-hand edge of the smartwatch, which can be used to wake the screen or navigate backward. Two buttons are on the right, you can push them for a quick start, pause and to stop your workouts. Your biggest concern could be its noticeably thick bezels around the display. However, this can be referred to brightness of the Versa’s touchscreen, because it makes easy to read the display, even in direct sunlight. It lacks always-on screen option, but a flick of the wrist, a strong finger tap or a push on the left-hand key can wake it up. The Versa is available in black, silver, and rose gold colors, and you can also choose from a range of leather, silicone, woven and metal bands. Unlike the Fitbit Ionic, the Versa doesn’t come with built-in GPS. So, if you need to track your running route, take your phone with you. However, it does come with storage for about 300 of your favorite music tracks, which enables you to go in the gym without a phone, but for running, it won’t help, as you will have to take your phone with you anyway. The device has an NFC chip onboard that enables contactless payments, but it’s not completely functional yet. Meanwhile, In the US, you will have to spend an extra $30 for this option, which is available on the Special Edition Versa. You can dive in the pool wearing the Versa, as it is water-resistant up to 50 meters, and it displays all that tracking information using optical heart rate monitor, altimeter, 3-axis gyroscope, and 3-axis accelerometer. Aforementioned sensors enable the Versa to track different activities including running, cycling and swimming. You will also be able to track your general workouts, like weight lifting and interval training. Other activities that Versa gives you the information about include calories burned, heart rate, sleep, steps count, distance covered and floors climbed. The watch is very straightforward to use, and that’s the key here for anybody who is new to the smartwatches, in particular. The Fitbit OS 2.0 runs on it, which is simple to navigate and you will be able to access key features of the watch with few swipes and taps. For instance, just swiping up on the main screen will give you a quick view of your daily stats. When you’re running, the watch tracks your pace, time and distance, and for any more information, you just need to swipe. When you stop, tracking is paused automatically by Run Detect, and it resumes once you start moving again. If you hit certain milestones during your running exercise, gentle vibrations notify you, so you don’t need to look down at your watch again and again. Before jumping in a pool for swimming, specify its length and the Versa will keep track of the lengths that you have finished but the given input will remain default pool length. This means, whenever you go to a pool of a different length, you have to manually specify it before swimming, in order to get accurate data. Another handy feature in this Fitbit is that you can quickly measure yourself against other people. Just open the app, go to the Heart Rate section and there you will find a Cardio Fitness Score graphic, which is estimated interpretation of VO2 Max, calculated on the basis of your heart rate, age, weight and running pace. This will give you an idea about how much your score has improved after daily physical activity. By analyzing data on the Cardio Fitness Level graphic, you can compare yourself with other people of the same age and gender, and check where exactly you stand. You can also see similar comparisons for sleep tracking. Using changes in your movements and heart rate, the Versa monitors your sleep. Different sleep phases like, awake, REM, light and deep are displayed by Fitbit app in the form of a graph. 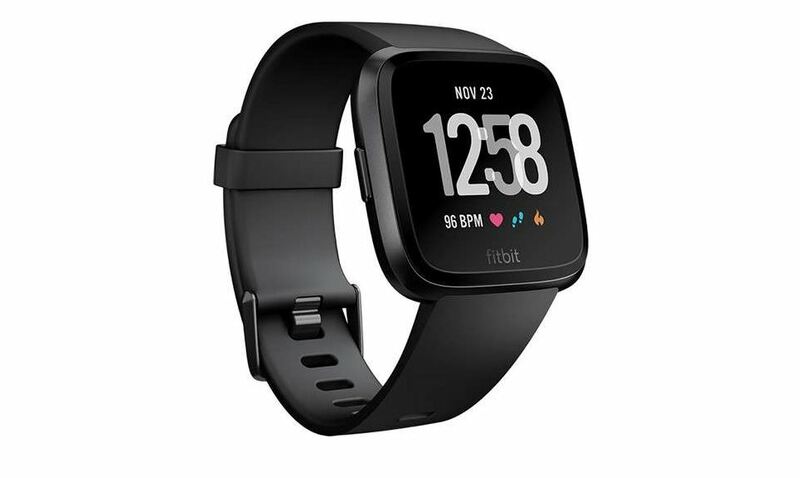 The Fitbit Versa comes with period tracking feature, which is offered to the users with the age of 13 and above. Tapping and holding a dashboard tile in the Fitbit App would enable this feature, and then you can add the Female Health tile once it pops up. After logging your periods, you can keep track of your cycle and check when your next period is expected. It also displays how your cycle and symptoms vary on a monthly basis. Fitbit says that the battery of Versa would expectedly last at-least for four days on a single charge but after testing it showed some amazing figures. It actually lasted more than four days or even five days. It lasted for five days when connected to the phone via Bluetooth and managed to last for 6 days untethered. In case if you need to extend more, adjust screen brightness to dim. The Ionic lasts 7 days as claimed by the company but many other smartwatches don’t even come close to Versa, the Apple watch, for instance, needs charging almost daily. Versa is better than Ionic in many ways. It comes with an almost similar feature set and is more stylish than Ionic. Also, it costs significantly less and offers a wide range of activity tracking features, including swimming. Ease of use and great battery life are the real feather in its cap. However, there are some limitations that need to be fixed. Like a Windows Phone, it doesn’t support many apps. Hopefully, this will change with Fitbit’s planned updates. But it’s quite disappointing for some users — it doesn’t allow you to reply to the messages directly. Built-in GPS is also missing and you have to carry your phone when you are going out for running. In terms of performance and feature tracking capabilities, the Versa is undoubtedly an amazing smartwatch, but it seems right now it only targets casual users. It would be better for serious users to go for Ionic or may be more attractive the Apple Watch Series 3.